Proceed along the Princes Freeway towards Warragul. Continue on Lardners Track for 7 kms. Turn right at the Lardner Hall [the hall is on your left]. 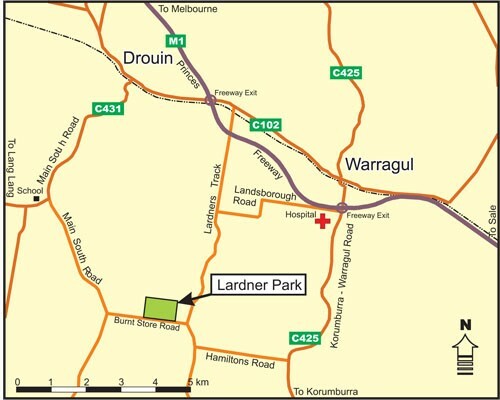 LARDNER PARK is less than a kilometer along Burnt Store Rd. Garden Expo signs will be on each corner to guide you. Proceed along the Princes Freeway towards Warragul. Turn off the freeway at the Warragul Hospital. Turn left into Lardners Track and continue for 4 kms.